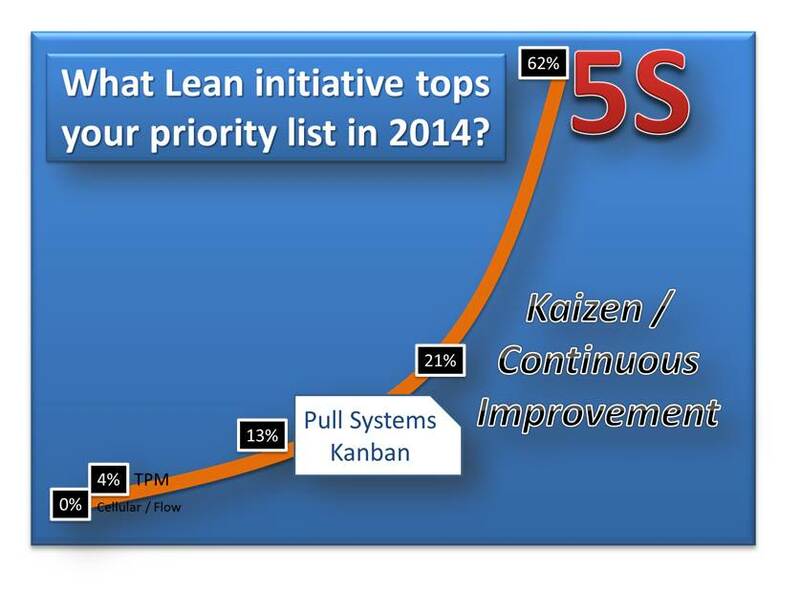 What Lean initiative tops your priority list in 2014? The results surprised me a little. I was shocked to see 5S being the largest percentage of responses; but then I thought that this probably made sense for two reasons: 1) many companies start their lean journey with 5S, and 2) it was probably biased since the website is 5S Supply (although we carry everything lean). The next thing that caught my eye was that Cellular/Flow had no responses – zero. Flow is one of the things that we are trying to create with lean so I was amazed to see that no one responded that they would have a focus on it this year. It was nice to see that 21 percent of the respondents selected Kaizen/Continuous Improvement as a major priority. I think organizations get too caught up in only using Kaizen Events (a.k.a. Rapid Improvement Events, Kaizen Blitz, etc.) and forget about the daily kaizen – as our friends Bruce Hamilton and Pat Wardwell from GBMP said it in their book (e2 Continuous Improvement System) “Everybody, Everyday”. To finish out the poll, only some responded that they would focus on creating Pull Systems/Kanban and even fewer mentioned Total Productive Maintenance (TPM). I know this was just a quick polling questions and I wouldn’t read too much into the results, but what do you think? « Gauge Range – The Original!